Valuation: How Much Is My Business Worth? If you know what type of business you want to purchase, we can help you find it… even if it’s not currently on the market. Once you have found a listing you are interested in, please download and return the forms on the “Buying a Business” page. 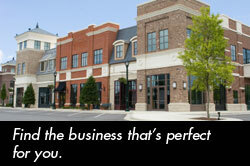 If you are thinking about owning your own business, have you considered a franchise? We have Master Franchises available as well as Independent Franchises and Resale Franchises. Let’s discuss your options. Contact us. Another great business opportunity you might want to consider: a childcare center. We are very experienced in the Childcare market. Give us a call to find out more. We have powerful search and match tools that allow us to identify business opportunities that are currently available in your area of interest. If we don’t have what you’re looking for, we’ll help you find it! Get in touch. Copyright © Atlanta Advisory 2019. All Rights Reserved.